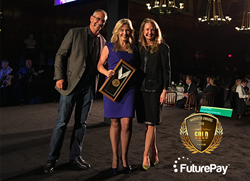 FuturePay, an online payment option that allows shoppers to buy now and pay later, today announced it has been honored as the Gold winner for Best Credit Innovation at the 2016 Innovator Awards. FuturePay was selected from a group of five finalists after facing rigorous examination from nine top judges in the payments industry. The Innovator Awards are held as part of the Innovation Project, which is sponsored by PYMNTS.com. The ceremony is meant to honor both new and seasoned payments executives and businesses. Award candidates also received thousands of votes from their payments peers. FuturePay is an instant credit solution where shoppers can take advantage of a buy now, pay later payment option at point of purchase. FuturePay provides shoppers with a flexible financing option that is affordable and convenient, with no credit card required. This gives FuturePay customers the flexibility to spread their payments out over time and pay for items on their own schedule. For details and a full list of 2016 Innovator Awards winners, visit http://www.innovationproject.com/2016-innovator-awards/. To learn more about how FuturePay can help your store increase AOV while reducing customer friction, visit futurepay.com. FuturePay is the simplest way for merchants to offer instant credit to their customers at point of purchase. With FuturePay, customers can buy now and pay later with one click, creating a streamlined checkout process on every device. With guaranteed payments and an easy integration, retailers can start attracting new customers instantly. To learn more about how FuturePay can benefit your business, visit http://www.futurepay.com. Follow us on Twitter @FuturePay.